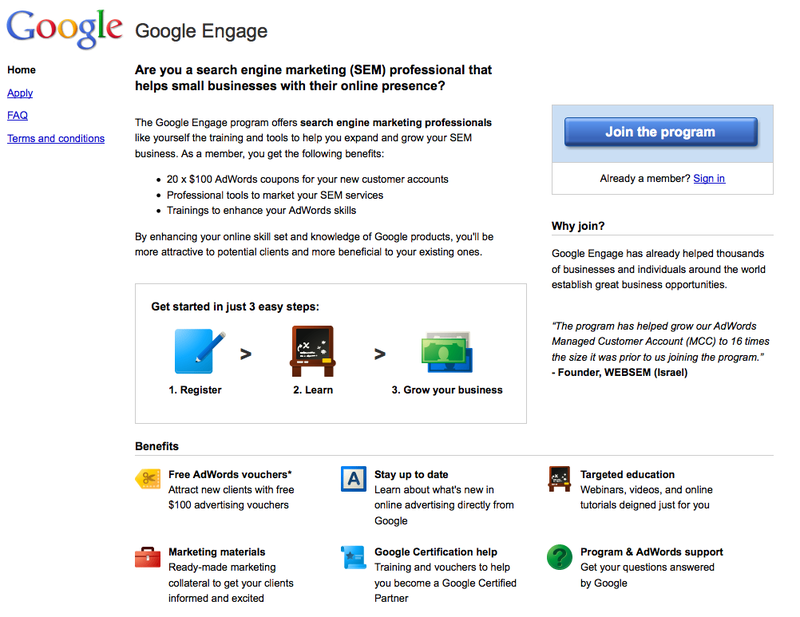 Google has established a resource center for search engine marketing (SEM) professionals, marketing consultants and other service providers that help small businesses with their online presence called Google Engage for Agencies. The Google Engage program offers web service providers the training and tools to help them expand and grow their search engine marketing business. By enhancing their online skill set and knowledge of Google products, search engine marketing professionals will become more attractive to potential clients. Google Engage has already helped thousands of businesses and individuals around the world establish great business opportunities. I have joined the Google Engage for Agencies program and look forward to receiving the benefits outlined by Google above. This entry was posted on January 31, 2011 at 10:28 am and is filed under Google AdWords Agent, Google Engage, Search Engine Marketing. You can follow any responses to this entry through the RSS 2.0 feed. You can leave a response, or trackback from your own site.